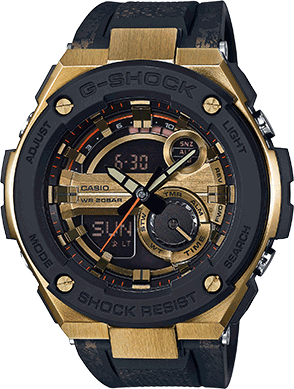 The GST200CP Series from G-STEEL maintains world-renowned G-SHOCK toughness with “layer guard structure,” combining resin bands with the elegance of metal. The layered face, hour makers, and dials give off a 3-dimensional look that adds to visual impact, large hour makers feature prominent edges that enhance visibility, and super illuminator ensures easy reading in the dark. The GST200CP models also have the added feature of a metal crystal pattern printed on each band.